Superheroes aren't the only characters from comic books making their way to the small screen. The CW network is home to many popular comic related T.V. shows like The Flash, Supergirl, and Arrow, is now coming out with the show Riverdale. This new show, which premiers later this month, looks as though it's going to be based very loosely on the characters of Archie, Betty and Jughead, who all live in Riverdale. It seems as though they are taking the light, comedic tone of the comic, and turned into a much darker teen drama. At least that's how it looks from watching the trailers. Tucked in between stories with Golden Age heroes like The Shield and The Hangman, is everyone's favorite red head from Riverdale, Archie Andrews. 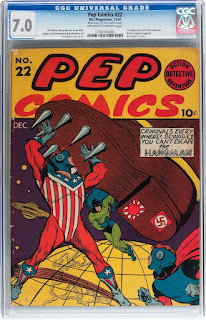 This comic came out just as the U.S. was entering into WWII, so many of the stories are war based or have our heroes battling the evil Germans in some for or another. 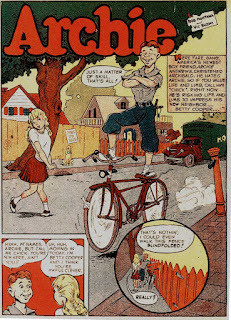 The war was everywhere during this time, like in the newspaper, on the radio, and even in comics, the lighthearted nature of Archie and his pals was a nice change from all of the news of the war. Not only does this comic have the first appearance of Archie, it also has the first appearance of at least two other long time Archie characters, Jughead and Betty Cooper. 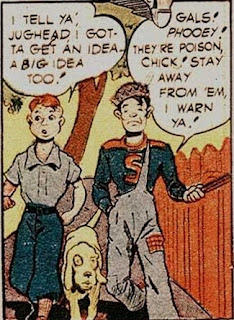 When we first meet Archie "Chick" Andrews, he is walking along a fence, trying to impress a pretty young girl. That young girl is none other than Betty Cooper. Betty has been a love interest of Archie's from the very beginning. However, it wouldn't be long before she had to compete with Veronica Lodge for Archie's attention, but I'll get to that at another time. Later in the story, we get to meet Forsythe "Jughead" Jones III. He is Archie's best friend. He's sarcastic, a bit on the lazy side and wants nothing to go with girls and all of the "problems" that come with them. He is kind of like Archie's sidekick. He also reminds me of Whimpy from Popeye, in the way that he is almost always eating something, usually a hamburger. This comic here is pretty damn near impossible to find, raw or graded. The CGC census numbers are very very low. To date, there have only been 23 copies graded by them, and almost half of them have been Restored. Most of the copies listed are low to mid grade, but there are a couple high grade copies on there as well. There is one 9.0 VF/NM and one 9.4 NM, both of which are Restored. If you're looking for a blue Universal label, you'll have to go down to a very respectable 8.0 VF. So it looks like this is a very scarce comic. If you're lucky enough to find a copy, expect to shovel out some serious cash for it, do to fact that there are so few copies, and that Archie is still a very popular character. There isn't a lot of sales information that I could find for this issue, but what I did find really blew my mind. There were a couple of copies that sold recently at Comic Link. Both were low grade and one is restored. The first is a CBCS Certified 2.0 G copy. This low grade sucker ended up selling for $31,249. The next copy, a CGC Restored 5.5 F-, sold for much less at $21,250. If there is any debate if restored comics sell for less that unrestored, then there's your answer. A higher grade copy, a CGC Universal 7.0 F/VF, sold at Heritage Auctions back in Nov. 2014 for $143,400. So, you're gonna have to have some pretty deep pockets if you want to add this comic to your collection. To the best of my knowledge, there haven't been any eBay sales for this comic in the past 4-5 years. I don't have any information on any sales that may have come before that. At the time of this writing, I could only find one copy available for sale online at MyComicShop. I've included the other links below because you never know when a copy will be thrown on the market. If you can't find anything at the links below, you can also check out Heritage Auctions for a copy.